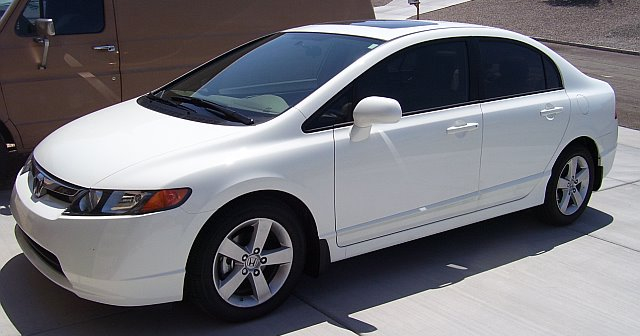 Yes, Jenny and I traded in her 2005 Civic for a brand new 2008 Honda Civic. Why? Because the old Civic already had 60,000+ miles on it and we wanted to trade it in while it still had some value to it. Plus, the new 8th generation Civics look so damn cool! We’ve had the new car for a few weeks now and love it. We got the EX model which includes a number of cool features including; alloy wheels, moon roof, tinting, stereo and cruise controls on the steering wheel, and an auxiliary/mp3 player jack. The car looks great and handles great. The only beef I have with it is that the stereo is a little weak. I like the factory head unit and want to keep that, but wouldn’t mind upgrading the speakers and adding an amp, sub, etc. Jenny won’t let me put a carPC in here. 🙁 Guess I’ll just have to wait until I get my new vehicle to do that. New car looks awesome man! Wish I had my license lol. Damn, if only nice cars were cheap over here in the UK, the insurence costs more then the cars here. (Atleast for a new driver).